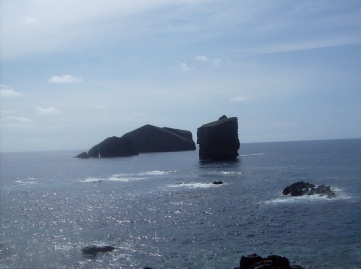 If you go to Sao Miguel Azores in August you are sure to see this picture played out hundreds of times across the island. 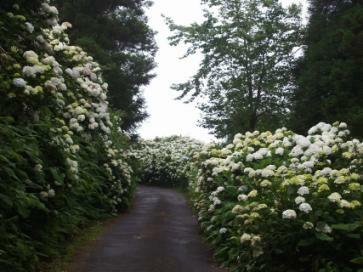 There are rows of hydrangeas like these all across the hills and along the roads. They are huge and are a bright blue or a pristine white. They are beautiful to see from a distance and up close. When you walk along side them there is a sense of anticipation wondering what is on the other side. And as you drive around the island you can only marvel at their abundance. The foreground of this shot shows that there is more than just hydrangeas on the island. Okay, you probably get the idea that the coast is quite rocky in spots! 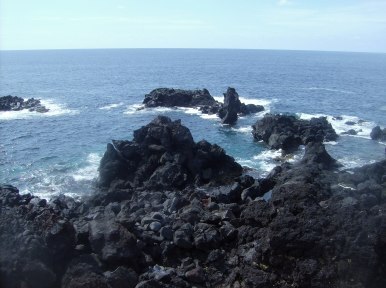 It's really neat to walk on the volcanic rocks and touch them. They are quite light, porous, and sharp in spots.